Ohhh myyy gooodddnesss this YOGURT. It’s so good! And was so missing from my life before this week! As soon as I started following the baguette-crumb trail of delicious French recipes, I couldn’t get away from the fact that so many French women and men enjoy yogurts on a daily basis. For the French, yogurt is 99.99% of the time made of cow’s milk, as well as sheep and goat milks (just as in the rest of the world). Their yogurt is decidedly simple: milk + cultured bacteria. These types of bacteria are part of a natural fermentation process that has been used for as long as much of human history. A documentary series that I really enjoyed is Cooked by Michael Pollan (available on Netflix). He has an entire episode devoted to fermented foods as used throughout the world. One theory he suggests is that the discovery and practice of modern agriculture was not necessarily motivated by our human desire for food, as much as our hunt for reliable ways to cultivate alcohol. Interesting, right? Or maybe you yawn through these types of shows like Ryan does, but don’t worry, I’ll do the research for you and me both. Anyways, just as alcohol uses fermentation, so does yogurt. Research is suggesting nowadays that traditionally fermented foods (with their probiotics still alive and well in them) are pretty great for us, hence the explosion of fancy sauerkrauts, kimchi, and kombucha crowding their way onto many grocery store refrigerated sections. While these grocery options are convenient, they can also be laced with pounds of extra salt and sugar that we’d thrive better without. For this reason, French people often make their yogurt at home with the result of yogurt that affordable, simple, and incredibly delicious. The French usually eat yogurt plain (no artificial sweeteners or fake fruit-on-the-bottom goo) or with a spot of homemade jam or fruit. 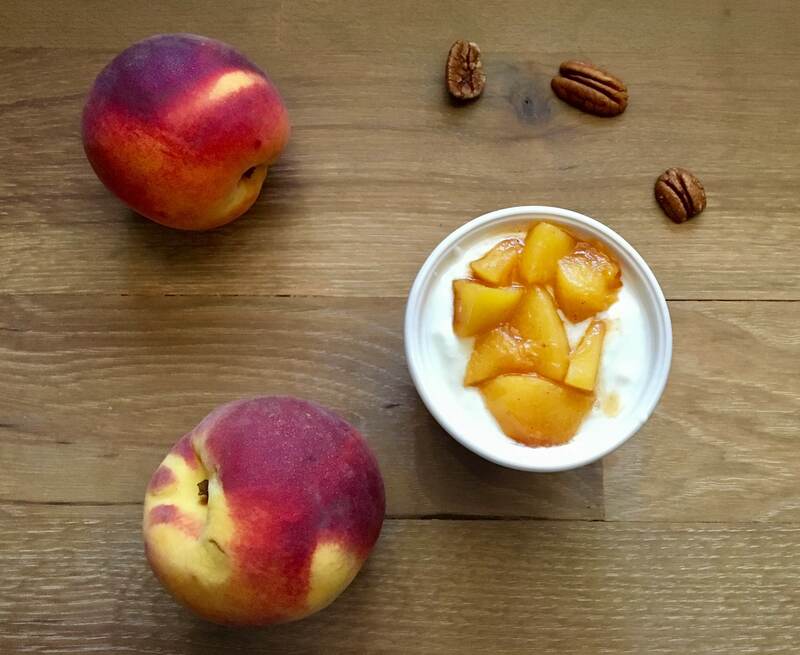 When yogurt is good yogurt, these options become absolutely more attractive than the flavored yogurts in the store. 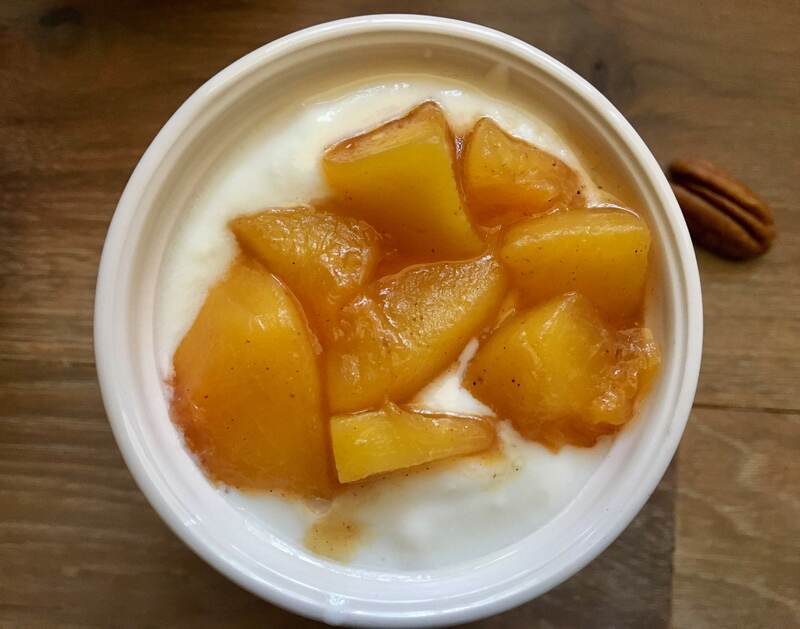 As is the theme of this hunt, I wanted to see how I could get the world of homemade yogurt to open up to me within the vegan realm. And it did. Beautifully and deliciously! Now: first things first. I do not have a yogurt maker. I’m likely going to get one, but Ryan and I are flying to a wedding in Sonoma in a few days and if I’d ordered the one I want (Euro Cuisine YM80), it would have arrived while we were away. Undeterred, I decided to hack together some recipes and see if I could make something work. The inspirations for this recipe came from multiple sources: the membership forums on Dr. Joel Fuhrman’s website (all used yogurt makers and store-bought, powdered “starters”) and a recipe post by Mireille Guiliano (French Women Don’t Get Fat). My goal: the most delicious, simplest possible yogurt recipe without powdered “starter” culture and without a yogurt maker. Here’s what you need to know: Yogurt is a simple recipe of milk/liquid + bacterial culture (“starter”). The hands-down easiest milks to use are coconut milk and soy milk. I saw a lot of recipes for coconut milk yogurt, but wanted something lighter than coconut milk. With soy products, I skip isolated soy protein and “fake meats”, but do enjoy tempeh and miso (fermented versions of soy). In the past soy milk has given me indigestion, but I reflected that perhaps that could be avoided by fermenting the soy milk. The #1 recommended brand of soymilk on the Dr. Fuhrman forums was Edensoy Unsweetened. I wasn’t about to mess around when all these people had experimented plenty. (Plus, I’d tried to make yogurt using my cashew-hemp milk. It was tasty, but didn’t thicken despite adding arrowroot powder. It was a great “kefir”, but not a thick, Greek style yogurt like I wanted. And here’s a secret: you do not need a specialized starter or expensive probiotic supplement to culture your plant-milk. 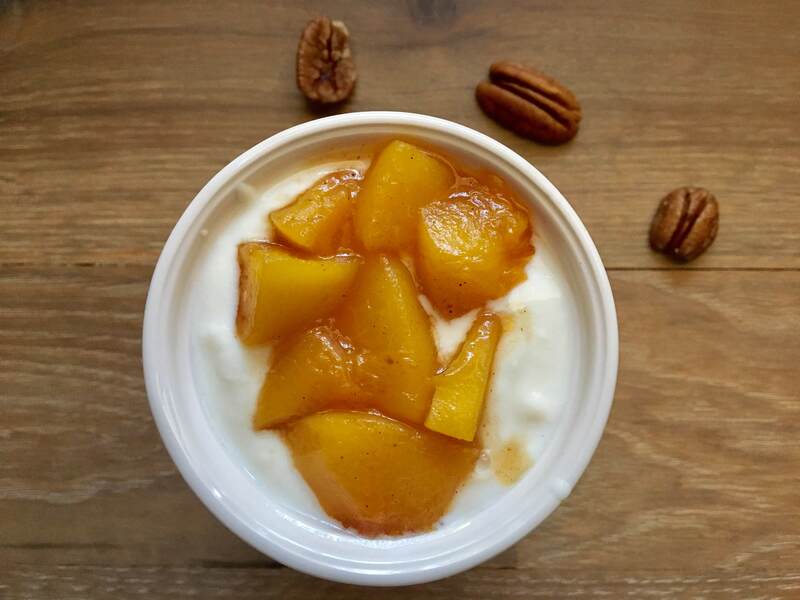 All you need is some store-bought vegan yogurt. 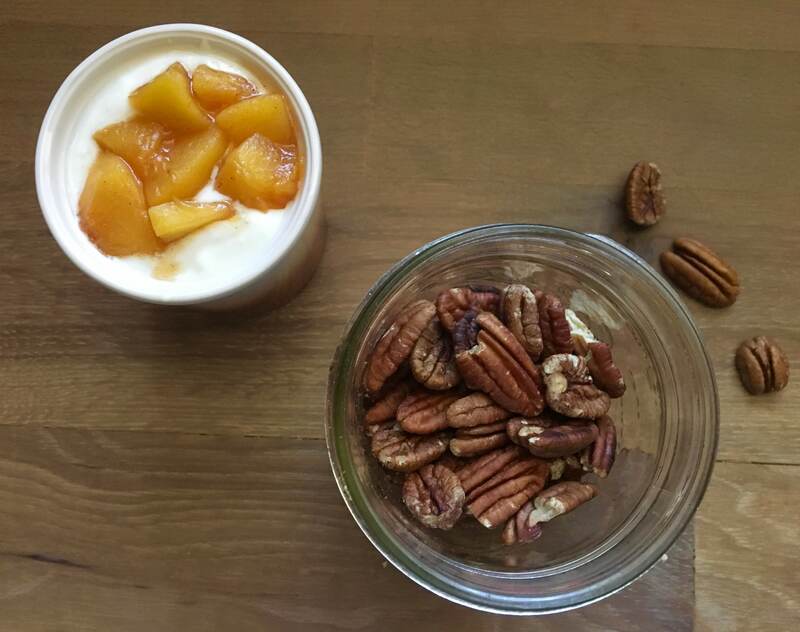 Next time you’re at the grocery store, pick up 1 small container of plain vegan yogurt. It’s fine if it’s another type of milk (I used cashew milk yogurt). If it were me, I’d choose the one with the fewest added thickeners. For the fermentation to be successful, the plant-milk+starter mixture must be kept in a “warm place” for 4-8 hours until the yogurt sets. Plan A: If it’s summertime and you keep your home warm, the countertop should do. Plan B: If you have an oven with a light that turns on, you should be able to put the yogurt in the closed oven with only the oven light turned on. Neither of these options would work for me. It’s the height of summer, but Ryan likes our house cold. It’s 87 degrees outside and I’m wearing a sweatshirt right now. Also, for some reason, our oven light is out. We’ve replaced the bulb, but the oven light itself is blown. Bah. If you find yourself in a similar tight spot, don’t worry: I’ve got you covered. Plan C involves creating hot water baths for your jar(s) of fermenting yogurt. It’s a little more involved than Plans A & B, but it worked well. 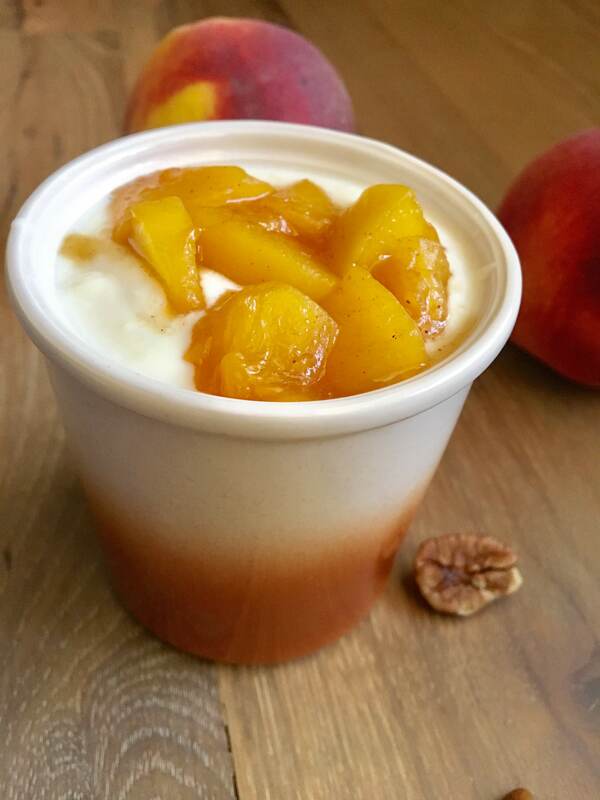 If you want to top your yogurt with this delicious peach compote, check out my Easiest (Most Delicious) Peach-Vanilla Compote recipe! This creamy vegan yogurt is a delicious breakfast along with fruit or a dessert option with a homemade crumble. Enjoy it at all hours for pleasure and a happy stomach. Pour entire container of soymilk into a saucepan and turn heat to medium. Stir and heat until temperature reaches 110-115 degrees Fahrenheit using a candy thermometer. This should only take a few minutes. If you don’t have a candy thermometer (I don’t), test with a clean finger. The temperature is correct when the soymilk is slightly uncomfortably hot, but you can keep your finger in the liquid for 10 seconds. Turn off heat and pour the warmed soymilk into a large glass jar or multiple glass jars. Stir in store-bought or previously homemade yogurt using a plastic or glass utensil (metal may interfere with fermentation process). Ensure the mixture is stirred well so that the store-bought yogurt bacteria is spread throughout the soymilk. Cover the jar with a towel and leave in a warm place on the countertop for 4-8 hours, checking intermittently. Cover the jar with a towel and place in the oven with only the oven light on. This should warm the oven up enough to incubate the fermentation process. Ensure the water line reaches to or beyond the soymilk inside the jar. Check the water every hour or so to ensure that the temperature remains warm. Refresh the hot water bath as needed to maintain a warm temperature around the fermenting yogurt. Once the yogurt has thickened to your preference, add a top or lid and store the yogurt in the fridge. After a few hours it should start to smell slightly yeasty or like yogurt. The longer the yogurt stays out and fermenting, the “tangier” it will taste. If you are using option 1 or 2 for fermentation, you can leave the yogurt overnight and check it in the morning. The yogurt should keep in the fridge for approximately 5 days. Other plant-milks and other soymilk brands will vary in results due to the amount of protein, fat, and sugars contained within them. The finished liquid will still contain healthy probiotics, but may not thicken without the use of thickening agents (e.g., arrowroot, corn starch). I haven’t successfully experimented with these, yet, but if you find a mixture that works please do share in the comments below.